While watching their young children play, Pat Martin and her neighbor were discussing the need for a safe playground in Plymouth. Though the town had McGee Park, with a nice gazebo and grass, there wasn’t a playground with a water fountain, and the restrooms were not always open. Families used the park because they enjoyed downtown Plymouth and wanted to ‘shop’ and hang out in their own community. Their discussion quickly led to the planning of Sharkey Park. One of the their first conversations was with Amador Community Foundation. There was no money, and they had never organized such a project. They quickly set up the first non-profit fiscal sponsorship through ACF so they could begin accepting donations and putting their ideas to work. After checking out city owned properties, they approached Sharkey Begovich’s family who owned the vacant lot next to MeGee Park, and they agreed to use the property as a park. 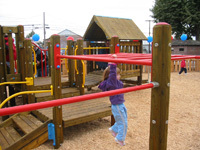 Deve’s excavating helped level the back portion for the playground with parking up front. People would stop and ask what was going on, and the donations started pouring in. Fundraisers were held at the park with local musicians donating their time. Beth Sogaard would send her employees over to help cook and prepare the meals, and many volunteers and donors were recruited to help. Over $40,000 was raised to help cover the actual playground equipment, wood chips, supplies and a supervisor, but everything else was donated. In-kind donations such as cement, pavement, installation, planning, plants, fencing, the water system and much more brought the total to well over $70,000.